Willow knows she’s different from other girls, and not just because she loves tinkering with cars. Willow has a gift. She can look into the future and know people’s dreams and hopes, their sorrows and regrets, just by touching them. She has no idea where this power comes from. But the assassin, Alex, does. Gorgeous, mysterious Alex knows more about Willow than Willow herself. He knows that her powers link to dark and dangerous forces, and that he’s one of the few humans left who can fight them. When Alex finds himself falling in love with his sworn enemy, he discovers that nothing is as it seems, least of all good and evil. In the first book in an action-packed, romantic trilogy, L..A. Weatherly sends readers on a thrill-ride of a road trip — and depicts the human race at the brink of a future as catastrophic as it is deceptively beautiful. Willow is blonde, beautiful and 16. She's nowhere near you average teenage girl though. Besides her love of mechanics, she also has a gift. She has the ability to know a person’s past and future with just a touch. She doesn't know why she has this gift, only that it's there. Alex is an Angel Killer. He has been trained to see the angels' for what they really are, evil. He and his fellow Angel Killers travel around the country to kill these Angels in an attempt to stop them from destroying human life. When he's sent to 'take care of' Willow, he sees that she's not like other angels, and that something just isn't right. Vowing to protect Willow at whatever costs, they race across the country to New Mexico in hopes of finding fellow Angel Killers, so they can save the world. The last thing they expect is to fall in love along the way. Angel Burn is an absolutely fabulous book! I don't have much experience with angel books yet, so this book was something totally new for me. The plot was well thought out, and absolutely wonderful. I was kept guessing, in suspense, right up until the end. Full of surprises, action and a quite a bit of romance, Angel Burn will leave you hooked, and wanting more! The main characters in the story are well developed. I really like Willow. She's kind natured and strong willed. I love that she likes to work on cars. That totally sounds like me when I was that age. She loves her mom more than anything, and cares about her friends and the people around her more than she probably should. (I didn't really care for her BFF in this book.) I really liked Willow, and was rooting for her the whole time. Alex is strong and determined, smart and really totally hot. (Strong, silent type. My fave!) He's determined to rid the world of the angels'. Towards the middle of the book we get to see a softer side of him. I really enjoyed their interactions, and watching their relationship grow. The angels' are the bad guys. Their world is dying, and there are no resources there to keep them alive. So they come to earth, and steal the life force from humans. This feeding is called Angel Burn, and it can be deadly to humans. I can't even imagine what the world would be like if this really happened. Scary! Overall, this book was a really great read. Different than a lot of books out there, and that's just what I needed! I can't to read the second book in the trilogy! 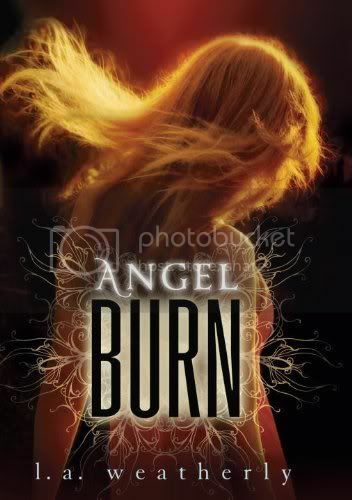 A HUGE thank you to Candlewick Press and NetGalley for allowing me to read and review Angel Burn! I have this book, it's just called Angel in the UK, sitting on my bookshelf. Everytime I read a great review of it I think I really must pick it up, but then another review book arrives lol. I'm glad you enjoyed it. You should definitely read it! It was great! I love this book!! It was so good! And great review! Great review! I'm reading this at the moment and it started off really strong (I was addicted for the first 360 pages). Need to find the time to finish it though.